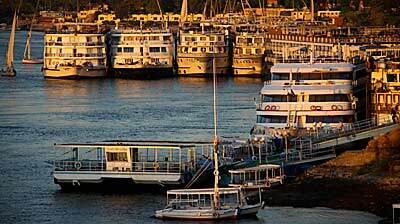 transfer you to your destination in Aswan (eastbank). Sometimes we are asked to pick up for free from the airport. I am sorry to say, this is not possible. Representative and driver have to leave Aswan 40 minutes before arrival of your airplane and drive empty to the airport (without a guest as taxi drivers do), he has to pay to enter the area of the airport and wait for you - no matter how late your airplane will be. He will come with an official tourist car: clean, new, regularly checked, with air condition. He will wait for you with a sign showing your name. And - after you met and he helped you to put the luggage in the trunk - drive you to Aswan which takes again at least 35 minutes. Please understand a pick up for free is not possible. * The cars which are used are limousines in the size of Toyota Corolla (3rd or 5th picture) or microbusses (photo on top). New, regularely checked, with all lisences from the tourist police and professional driver. Driver and car are sent empty to the airport or trainstation to wait for you with a sign showing your name, no matter if the airplane or train is late, the driver will wait. Please understand that this service is different to a taxidriver hailed from the street, whose service has to be negotiated and still might include surprises like a stop at a bazaar (to be forced to buy papyrus, perfume or Alabaster) or a fight after your arrival, when he tells you that the price was for each person or the luggage is extra. Besides, taxis in Aswan are old, without AC and very oriental - you will see what I talk about after using one). With Aswan-Individual you will not be brought to any bazaar. The prices which you get from us are fixed. You will not be asked "for baksheesh", it is up to you to give a tip if you think the driver deserves it (as it is usual in every Western country). Long speech - short sense: if you want to save money you can try to pay less to a taxi driver. meet and assist you at the trainstation. In case of Anakato, Ekadoli Nubian Guesthouse, Bet El Kerem or Iberotel you would be picked up by motorboat (prices see above) to start the felucca tour from Elephantine. 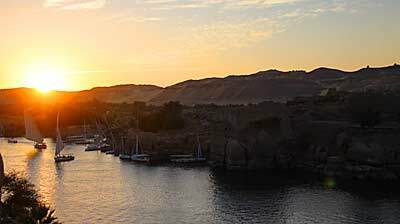 But of course you are welcome to come by yourself to Aswan to meet your captain at the place that suits you well. This applies also to guests from other hotels (for example Keylany), that are not located near the Nile. 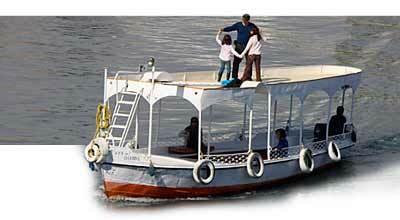 If you will have an excursion with Aswan Individual before sailing (f.ex. Philae, coming from Luxor, etc), Waleed or a representative will wait for you and introduce the captain to you. Any other transfers are no problem!